What Factors Are Important When Looking At Industrial Robotics? Industrial robotics is making manufacturing industry smarter and efficient by minimizing waste, defects, downtime, and cost reduction. 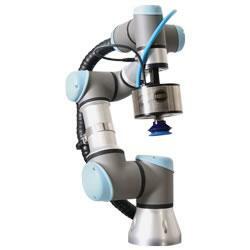 The research and development activities have been carried out and new robots have been introduced for various applications such as paint removal, assembly, and quality in the aerospace sector. 08/09/18, 07:55 AM | Industrial Robotics, Factory Automation | Electromate Inc. The GPL-V (shaft) and GPL-H (hollow) are our lowest backlash (≤ 0.1 arc minute ) planetary gearboxes for horizontal and vertical robotic applications. A patented design guarantees that the backlash will not increase over the life time of the gearbox. Very high tilting rigidity results in excellent positioning accuracy with a rated 20,000 hours which is over 3x longer than comparable gearboxes in the market. HELUKABEL, one of the leading global manufacturers and suppliers of cable, wires and accessories, recently held an open house and "cable ribbon"-cutting ceremony to officially open its new 75,000-square-foot U.S. headquarters in suburban Chicago, IL. "The 2018 winners were chosen from hundreds of business professionals," said Glenn Smith, Mouser Electronics President and CEO. "We want to honor and thank the devoted individuals who won our Best-in-Class Awards. Each one of them has played an essential role in helping us introduce and promote their companies products to our customers." Ease of Use, Holding Torque for Positioning, and Increased Positioning Accuracy to Common Speed Control Applications.